Awards: Won 1 Oscar. Another 33 wins & 8 nominations. When Daigo, a cellist in Tokyo, loses his job, he and his wife must move to his home town to live in the quirky little house left to him by his deceased mother. 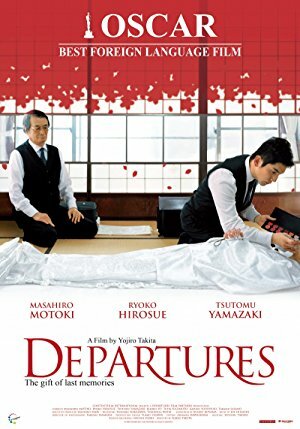 Needing work he answers a classified ad entitled "Departures" thinking it's for a travel agency only to discover that the job is preparing deceased bodies for burial. While his wife and others are horrified by this profession, Daigo, a sensitive man, finds he empathizes with the families of the departed and is good at his job. Still, his childhood town is a reminder of the father who left when he was four and he battles with his resentment over this until fate takes his hand.